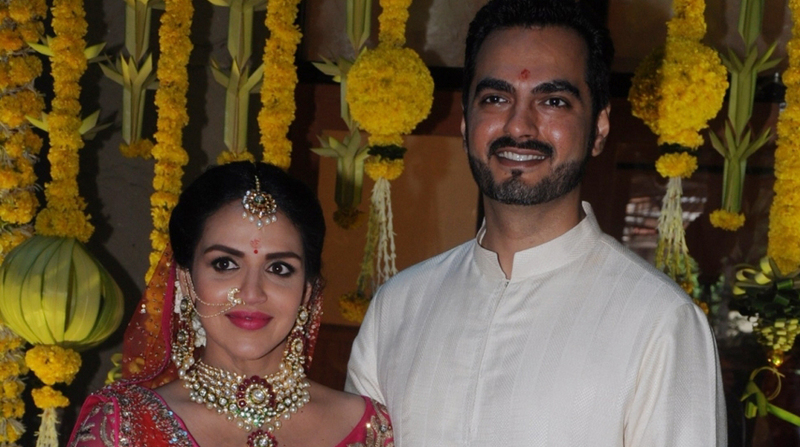 Actress Esha Deol thanked her younger sister Ahana for hosting the “most fun-filled baby shower” for her. Esha, who is expecting her first child with husband Bharat Takhtani, tweeted a photo of the couple in which she is seen kissing him. “Ahana thanks for hosting the most fun filled baby shower! And all my friends a big hug for making it a superhit,” Esha captioned the image which she posted on Twitter on Tuesday. Ahana, along with their common friend Varun Kapoor, hosted the party on August 27 setting the theme of the party to 1970s to 1990s retro music. They planned it with lavender themed invites, balloons, floral arrangements, assorted candies and personalised banners with a special lavender-based chocolate Belgium cake, with a miniature version of a vintage perambulator o top. Hydro-mocktails and cocktails, with Awadhi and Mughlai dishes were also served. The special thematic baby shower party also included fun games like tug of war, measure the mummy’s waist guess, diaper pasting games and more. The theme included guests wearing blue if they guessed it was a boy or pink if they guessed it was a girl. Ahana also ensured return gifts for the guests like customised bracelets for all, pocket square for boys and scarf for girls, special double Chocó-chip and salted caramel cookies.